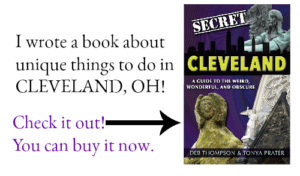 I’m always on the look out for ways that I can save money when I travel with my family. 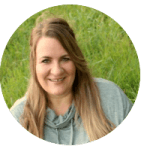 For the most part, I’m often able to dig up some pretty good deals but one area we typically struggle to stay on budget is food. Nine times out of ten, if we spend more on a trip than I’ve planned, it’s not because we stayed at the most luxurious hotel I could find or because we bought one too many post cards. It’s because I didn’t budget enough money for food. Feeding a family of five, three meals a day on the road, can easily add up to well over $100 and that’s definitely not from eating at the best steak house in town. Of course we pack snacks from home, find hotels that offer complimentary breakfast and prepare our own meals to save as much as we can. Cooking in a hotel room has allowed me to feed my family great meals for a fraction of the cost that we’d normally spend to eat out while we travel. When my family heads out on our 10 day cross country road trip, you can bet that my portable kitchen will be one of the first items I pack but this time it will have a new addition. While I was shopping at our local dollar store for travel surprises for my teens, I came across this handy container to store pills. I instantly thought it would be perfect to store the spices that I use most frequently when I cook. After all, just because I’m cooking in a hotel room doesn’t ever mean that the food will be bland and I don’t know about you, but space is a premium in our vehicle. I certainly don’t want to take it up with a ton of spice bottles and containers. 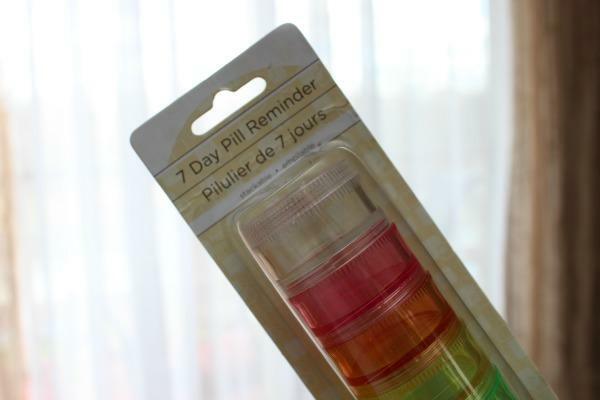 The pill container is perfect. Each individual compartment will hold about 3/4 of a tablespoon of spices and screws together tightly. 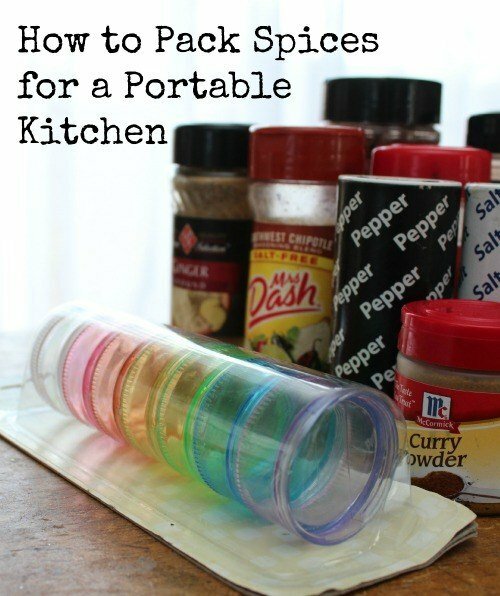 A perfect way to pack spices in a portable kitchen! I could have made my containers really cute by spelling the names of each spice with stickers but a black Sharpie was quicker and cost less. In a matter of minutes I managed to fill and label my containers. What tips can you share that help you save money on food when you travel? I’m a veteran camper/backpacker who finds most of this type of articles to be crap. Your idea is brilliant. Simple, cheap, effective, space saving 4 for 4! Thank you!! Ohhhhh I want that spice kit for my teeny apartment at home… rushing off to buy one now. What a genius idea! This would be perfect for camping too! That is a fabulous idea! 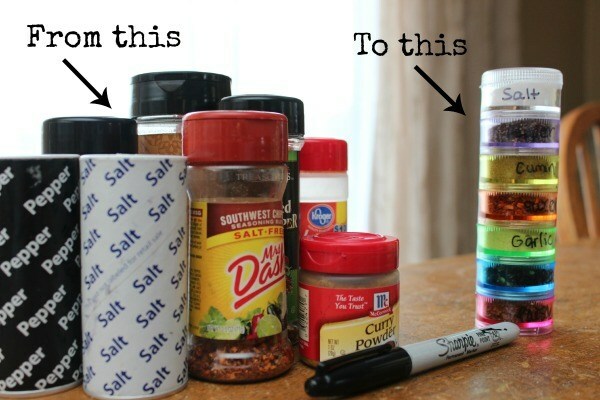 We usually just dump spices in baggies, but this is so much better. To save money on food, we usually bring (or buy on location) bread and non-perishable sandwich fixin’s (like PB & J). We also try to stay in hotels or timeshares with kitchens – that way, we can cook for ourselves. what a great idea! I would not have thought of it! This is brilliant! I love this idea and it’s so useful. Definitely a creative solution! 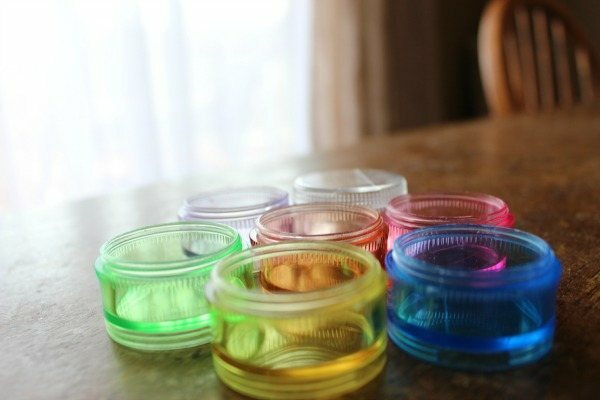 I sell Tupperware and we have a bunch of small containers for purposes like this that i use to bring pills and other small things we need for travel. Oh, this would be great for when we go camping. I love it! Love this idea! Someone could even use this idea if they don’t have a lot of storage in their house. Awesome! what a cool container! Everything looks perfect! SMART!! I love this for our camping box!